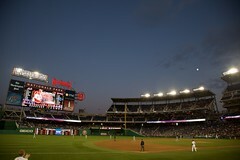 Tonight was why I still love the Nationals. They’ve been horrid this season, with occasional bright spots, and tonight was one. John Lannan went 6 full with good control in front of spotty and dicey defense, and then, when it counted, Justin Maxwell planted one just over the left field wall. Bang, Zoom went the fireworks, and the crowd went absolutely wild. Thanks for a good time tonight, Nationals. Now, go out and get better this off-season and give us something we can be proud of more often than not.